“Vassar could challenge comparison with sister institutions everywhere for the perfection of its material arrangements.” Though this quotation was accurate in its 1871 Scribner’s Monthly article and the campus has continued expanding and excelling with innovative architecture and use of space, many of the college’s original buildings have reached a state of disrepair. Renovation projects are nothing the college hasn’t seen before; however, most work on the residence halls has been primarily cosmetic and code-related — new flooring, fresh coats of paint, rewiring, and improved fire exits. But on June 1, all this will change. Jewett House (formerly known as “North”) will be gutted, the first large-scale project of an ambitious, long-term program to support the evolving needs of a residential college. “We have grand, but aging buildings that show, in many cases, the wear and tear of generations of lively use. The necessity is to preserve our architectural heritage, while making our buildings useful, vital, and attractive to students in the contemporary world,” said Vassar College President Frances Fergusson, herself an architectural historian. Residence halls in particular are difficult to renovate because extensive projects cannot be completed while students are living within them. Such projects, therefore, are often pushed aside — which means legions of Vassar students hold memories of a Jewett that remained remarkably unchanged over nearly a century of use. The college is strongly committed, according to Fergusson, to respecting those varied traditions while embracing and preparing for the future. By 1905, though enrollment was capped at 1,000 students per term, Vassar needed to increase its residential space from the existing four quadrangle dorms and Main House. The college enlisted Professor of Art Lewis Pilcher, who also designed New York State’s Sing Sing prison, to create a plan for the new building, which would be constructed using college funds. The Tudor, U-shaped building opened as “North” in 1907, but later was renamed “Jewett,” after the college’s first president, Milo P. Jewett — a Poughkeepsie educator often credited with convincing Matthew Vassar to open a women’s college rather than a hospital or library. Exterior restoration work on the tower began this spring. As the second largest residence on campus (after Main), Jewett has housed thousands of Vassar students — and countless tales. Folklore has been passed down like the furniture: Edna St. Vincent Millay ’17 dramatically throwing herself out of the tower, her fall being broken by the third-floor roof; the ghost of one of the first Jewett residents haunting the hallway in the fourth-floor transept, her footsteps echoing behind your own; Mike D. of the Beastie Boys (who is rumored to have attended Vassarfor one semester in 1984) tossing a keg from his room in the tower; and the cries of an allegedly abandoned baby’s ghost floating out of one of the bathtubs that has seen little use in decades. Stories such as these are fodder for the loyal Jewett community, repeated by generations of tight-knit residents like the Bennison family — Nancy Dante Bennison ’68 and her daughters Sarah ’99 and Emily ’02 all lived in the same Jewett room at points in their Vassar tenures. Residential life has been a focus at Vassar since the school opened in 1865 with everything and everybody housed in Main Building. Around that time, trends at American colleges had moved away from the English model (which stresses residences as communities for living and learning and is exemplified by schools like Oxford and Cambridge) to a view that dormitories were only needed to provide shelter and storage. As college budgets everywhere ignored residential halls, the popularity of fraternities, sororities, and off-campus housing grew. However, at women’s colleges — which sprouted up around the country at the turn of the last century — these housing options were deemed unsafe, leading women’s schools to concentrate heavily on residential concepts. 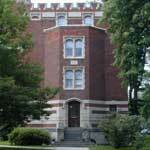 Residence halls evolved to provide homes-away-from-homes for Vassar women. Each provided its own dining services, and close bonds were formed among dormmates. Despite the fact that many students left campus for the weekends, and that central dining was eventually established, a great emphasis on dorm life as life flourished. The house fellow, house advisor, and student fellow programs were initiated to make the dorms more family-like and supportive; house officers work with the Vassar Student Association to provide programming (from all-campus parties to intimate study breaks), desk messengers (formerly referred to as “White Angels” or “White-Robed Maidens” because of their white uniforms and caring advising) continue to welcome and direct residents and guests, though they shed the nurse-like garb years ago. “With 95 percent of Vassar students living on campus, residential life, and the communities formed through it, are crucial,” said Associate Director of Residential Life Danielle K. Molina. And though much has been done to foster community in the residential halls, this is becoming more difficult in the Internet age and as the school expands in size. It has become increasingly clear that students can more easily make the connections necessary for a robust community if the college offers structures more conducive to doing so. Computer-generated renderings of Jewett’s new lobby, by Herbert S. Newman & Partners. Jewett, specifically, hosts a myriad of design mysteries that have become (or maybe always were) impractical, if not downright annoying: an elevator that simply does not stop at the second floor; balconies you can never reach; a mezzanine-level bathroom for residents of the third-floor tower area, complete with stalls so squeezed that those of all heights bruise their kneecaps when they sit to use the facilities; and a stairway tightly wrapped around a nine-story elevator shaft that no longer comes close to meeting fire safety codes. “Jewett has some architectural highlights, but overall it’s a poorly planned building. People certainly won’t miss that,” said Director of Residential Life Faith Nichols. The hall also lacks handicapped accessibility, as well as several community-building features (there are few shared paths and open gathering spaces, for example) that the original architects did not see a need for when planning a building in which women would merely sleep. After officially declaring its residential life decree and choosing Jewett as the first to go under the knife, the college then set about finding an appropriate surgeon for the job. Herbert S. Newman & Partners, an architectural firm based in New Haven, Connecticut, has completed similar jobs at Yale, Colgate, and Middlebury, and fit the bill. As specialists in residential “homes” for educational institutions, the firm’s plans include implementing a shared main entry, common path, and armature of circulation to emphasize a domestic precedent, maximize contact between members of the community, and give residents a sense of place; providing community spaces along the common path for gathering, presenting, and performing; and developing “spaces in between,” which is how the architects describe the nooks, alcoves, and stair landings where learning and interaction often take place accidentally and informally. They also aim to create ranges of rooming options for optimum flexibility and combination of private and public spaces. 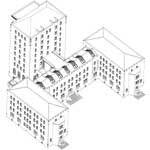 Clockwise, from top left: House fellow and advisor apartments will be expanded and renovated. 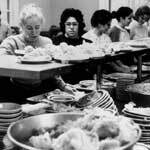 A typical Jewett meal rush in the days before central dining. 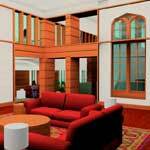 Architectural rendering for one of Jewett’s two multi-purpose rooms. Exterior plans showing new floor connections between the tower and the U-shaped portion of Jewett, as well as the new skylighted fourth-floor corridor. “Newman & Partners understands Vassar’s small-town atmosphere. Face-to-face interaction is important here, and their designs support that lifestyle,” Molina said. “Interaction, participation, and connection are all key.” Though it will be modern, Molina is quick to assure that the new Jewett will not look “spaceship high-techy.” Instead, the architects have searched for historical aspects of the building that will help bind new and old. They have identified “sacred spaces” — such as the parlor — that, other than necessary restorative work, will be left relatively untouched. 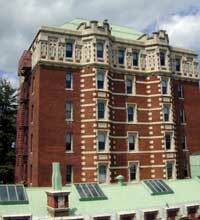 Molina also noted that keeping the exterior of Jewett in its true form is essential. The tower roof area underwent restoration work throughout spring semester while students slept, showered, studied, and socialized below. To retain the intricate detailing on the building, such as gargoyles, masks, and designed stones, molds were taken of terra cotta borders and details so new versions could exactly match their predecessors. The only major exterior changes will be the addition of a central handicapped entrance, walkways connecting more of the tower and main building, skylights to lighten the fourth-floor transept to allow for student rooms, and a north stair tower addition to remove the stairwell from the elevator shaft area. Though it would have been considerably cheaper and faster to raze the entire building and start from scratch, that was never a consideration for Vassar because of Jewett’s dramatic effect on the campus landscape and the college’s treasured connections to its past. Instead, the residence hall that cost $212,500 to build in 1907 will now cost $21 million to renovate. 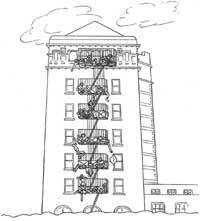 Traditionally used by sunbathers, the fire escape will become the tower’s enclosed stairwell. On June 1, Jewett’s doors will close to the entire campus — house fellows and advisors have to empty their apartments, no reuning Jewett alumnae/i will step inside their old home, and the class of 2006 will settle everywhere but Jewett in the fall. Swing space was constructed and the Office of Residential Life has creatively turned former singles into doubles, doubles into triples, and even some triples into quads in the other dorms to accommodate Jewett residents who have to clear out. But in the fall of 2003, if all goes as planned, a new crop of residents (and some of the old) will (re)enter their home — shiny and new, but still subtly revealing the stories and thoughts of Jewett residents past. 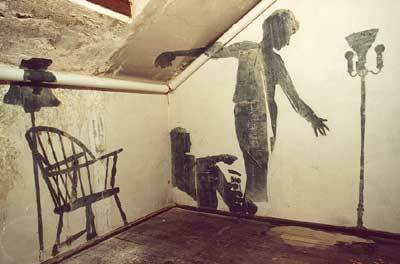 During initial examinations of Jewett, mysterious findings were unearthed in currently unused rooms. Recognize this? Email vq@aavc.vassar.edu. At this time, there is a multi-year plan of implementation for all residence hall and classroom building renovation projects. Look for more information in a special upcoming VQ insert from Vassar College. Photos by Special Collections, Vassar College Libraries; Herbert S. Newman & Partners; Anne Cleveland and Jean Anderson. Lilia Hutchinson, 6, is missing two of her bottom teeth and wears Harry Potter-esque wire-rimmed glasses. The glasses can be a bit of a problem, because Lilia — who is already an avid gymnast and, as her mother describes her, “a perfect little sprite” — keeps accidentally breaking them. “Vassar could challenge comparison with sister institutions everywhere for the perfection of its material arrangements.” Though this quotation was accurate in its 1871 Scribner’s Monthly article and the campus has continued expanding and excelling with innovative architecture and use of space, many of the college’s original buildings have reached a state of disrepair. For many, the word sampler conjures up an image of a box of chocolates. Vassar’s sampler collection, though, is of the needle-and-thread variety. Often viewed as homey arts-and-crafts stitchings displaying simple messages such as “Home Sweet Home,” these works of art are, in fact, intricate silk embroideries that were an integral part of a woman’s education from the 17th through the 19th centuries. And Vassar boasts an impressive collection of these needlework gems.